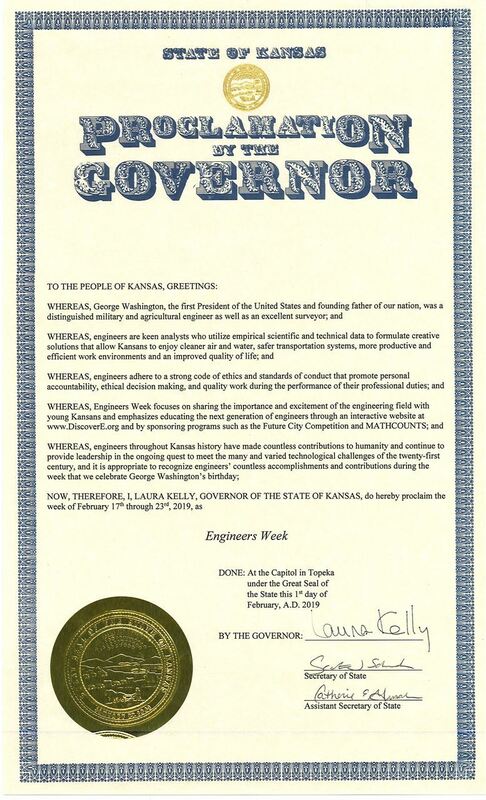 Since 1910, the Kansas Society of Professional Engineers has represented all engineering disciplines and practices for the state’s licensed professional engineers.We represent licensed professional engineers who practice in industry, construction, private practice, education, and government. 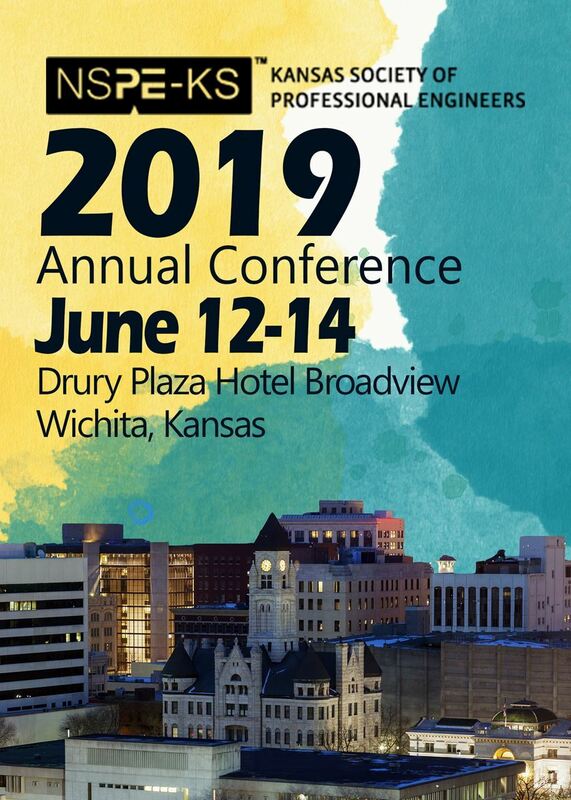 The Kansas Society of Professional Engineers membership provides professional engineers with the resources and services needed to be better informed and better connected within the professional engineers in your community. Please click on the image to read the full PDF. The Kansas Society of Professional Engineers is excited to announce the creation of the University of Kansas Student Chapter. The chapter, sponsored by the Topeka Chapter, was created after a group of KU engineering students approached KSPE. Student members of KSPE qualify for a free membership if they are enrolled full-time in an ABET-accredited engineering program, an engineering or pre-engineering program that has a transfer agreement with an ABET-accredited engineering program, or are a student enrolled full-time in a graduate level engineering program. 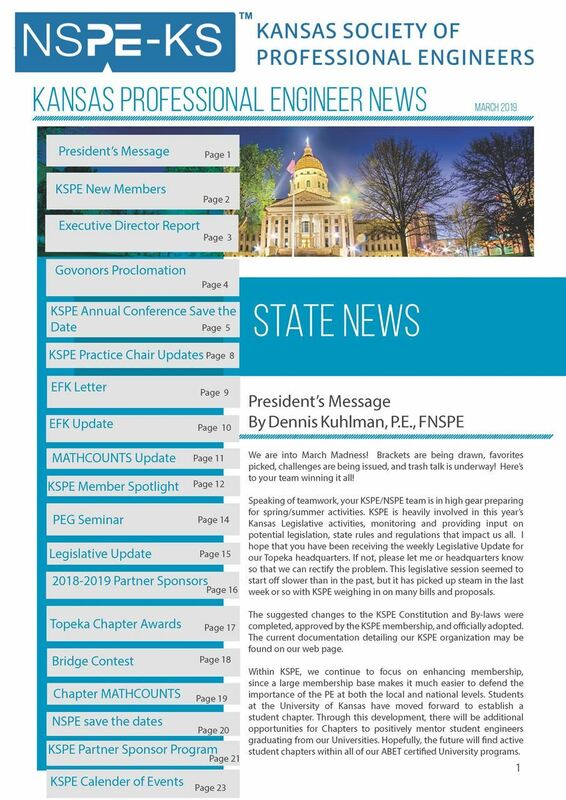 Student members receive KSPE newsletters and emails, Topeka Chapter news, the digital edition of PE and members-only e-newsletters, like NSPE Updateand Daily Designs. Karen Vazquez, a civil engineering student, is the president of the new student chapter of NSPE. The student chapter’s faculty advisor is Robert Lyon, P.E, who has served on KU’s faculty since 2004. Bob Koopman, P.E., who serves on the KSPE Board of Directors representing the Topeka Chapter, has been appointed Chapter Liaison Officer for the chapter. Interested in advertising with KSPE?